Those who walked by McKenzie Hall on the morning of July 18 saw something that made them crane their necks and furrow their brows: a bright red fire truck, ladder fully extended, with helmeted firefighters taking the fast track to the top of the building. Haily Griffith from University of Oregon Safety and Risk Services was quick to answer the onlookers' question before it could be asked. "No emergency," Griffith said. "We're just working with the fire department on how we can rescue people from the roof if we had to. Just trying to be prepared." Passersby would nod, relieved, and then usually watch for a few minutes before moving on. 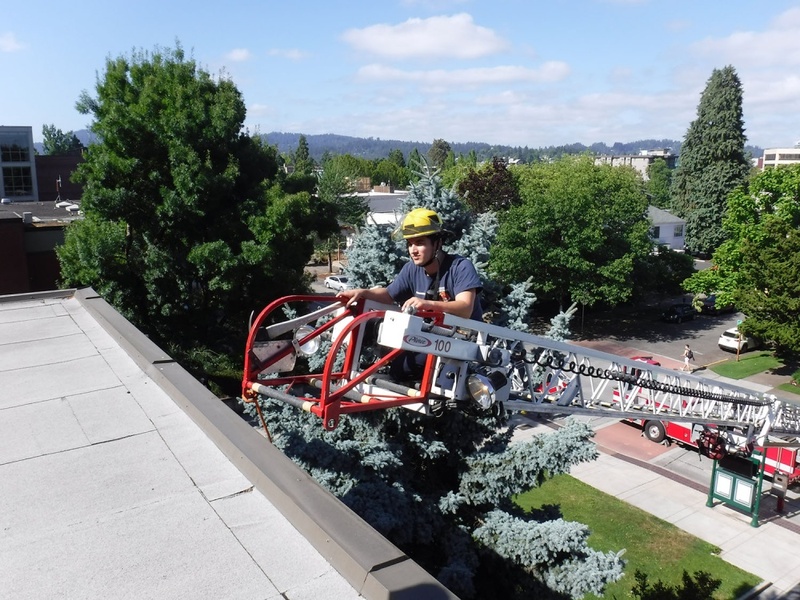 Drills for about three hours on July 18 and 19 were the first of their kind with the Eugene Springfield Fire Department, preparing for how campus staff would work with local emergency responders on unfamiliar building access. More could follow in the future for other rooftop rescue, or confined space and tunnel rescue training. Griffith, UO's occupational health and safety manager, was outfitted in a bright yellow safety vest and a battered hard-hat, pulling double duty that July day and the next, making sure pedestrians didn't walk into the ladder truck's perimeter, while keeping an eye on the drills in progress and talking by radio to a safety and risk colleague on the room of McKenzie Hall. "These drills provided us with a great opportunity for us to work more closely with our city fire department, and I was excited to see the number of units that participated in the drill," Griffith said. About two dozen firefighters from two stations participated in the July practice, getting to the top of McKenzie Hall and Prince Lucien Campbell Hall. Safety and risk partnered with Campus Planning and Facilities Management, with employees from both areas figuring out just how they could help firefighters get onto campus, get situated at buildings, and quickly extract anyone from high above. Kevin Wilson of Campus Planning and Facilities Management was impressed with the drills' effectiveness. "The ability to work together to flesh out questions and plan strategies to address challenges will contribute to a safer environment and a more efficient response strategy all around," he said. "Simply raising safety awareness in general is a big benefit of the drills. They sparked a positive conversation about fall safety in general." The drills not only prepare for a rooftop evacuation that might be needed in a fire or other emergency that would cause people to escape to the roof, but also for workers who normally maintain rooftop equipment, and who could be injured and need rescue. It's all part of a preparedness plan that ensures that staff from the UO and other agencies like the City of Eugene will be able to work together effectively in a crisis, and that tough situations have been practiced in advance. "We are so fortunate to have a good partnership with Eugene Springfield Fire," Griffith said. "The more familiarity they have with our campus and with the work we do, the better able they are to assist us in an emergency." Rescue preparedness is just one of the Occupational Health and Safety projects. See others, including a host of workplace safety tips, at https://safety.uoregon.edu/training.